TransPennine Express is going back to the future with one of the three fleets of new trains it will introduce. Between now and the end of 2019, 44 new trains will enter traffic with TPE, serving Liverpool, Manchester, Leeds, Scarborough, Middlesbrough, Newcastle, Edinburgh and Glasgow Central. First to arrive will be 13 rakes of Mk 5A coaching stock hauled by Class 68s. 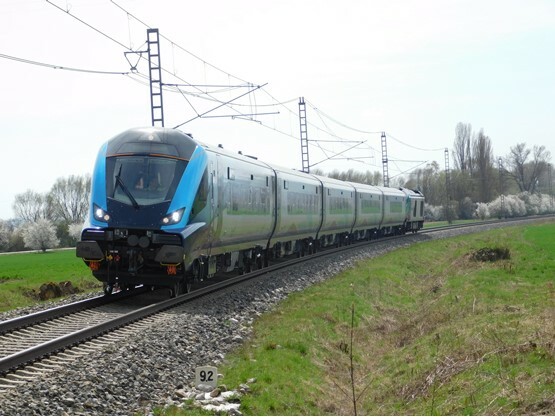 These will be followed into traffic in spring 2019 by 12 five-car Class 397 Civity electric multiple units from CAF, and in summer 2019 (earlier than planned) by 19 five-car bi-mode Class 802/2s. For the Mk 5A/Class 68 sets, 12 per day will be in traffic, with one complete set spare plus a Driving Trailer (DT). In total, 66 Mk 5As were ordered from Spanish manufacturer CAF. They will be the first locomotive-hauled coaching stock (LHCS) to operate trans-Pennine services since Class 47s were replaced by three-car Class 158s in January 1991. Since then the routes have become increasingly busy, and the shorter-formed trains were unable to cope. A plan to order extra Class 185 vehicles following their initial introduction in 2006-07 did not happen, meaning that TPE has suffered chronic overcrowding on its trains. So when FirstGroup won the franchise that began on April 1 2016, it sought to establish how capacity could be increased quickly. CAF was able to supply an LHCS solution, and less than two years after the deal was announced (RAIL 802), the first set is undergoing testing ahead of the first coaches arriving in the UK at the end of May/early June. Twelve rakes of coaches per day will operate, each formed of five coaches plus a Class 68. The sets will have 291 seats plus six tip-up seats. There will be a catering facility for First Class, as well as a trolley in Standard Class. Of those 291 seats, 30 will be First Class – double the current number in a three-car ‘185’. Each set is formed of one First Class coach with catering, three Standard Class coaches and one Driving Trailer which also has 64 Standard Class seats. There are three toilets per train, with the accessible toilet and seats in the First Class vehicle. TPE Major Projects Director Chris Nutton says testing in Velim (Czech Republic) has accelerated the process. “We are able to check with CAF regarding the noise, the brake performance and energy usage. It is a rail laboratory development here, and we can do six to eight months’ work here in a few weeks,” he says. RAIL travelled to Velim to see the coaches being tested. Located around an hour’s drive from Prague, the facility has two test rings, of which the outer is 8¼ miles in length. Running at speeds of up to and including 100mph is possible, replicating the speed at which the trains will operate in traffic. On board the Mk 5As, it is noticeable that the colouring and trim is identical to the refurbished ‘185s’. Tweaks have been made, with more to follow – for example, in First there will be leather strips on the cushions that have yet to be put in place. The catering facility, much to the delight of TPE New Trains Project Manager Chris Massey, has a water boiling system that operates automatically. When it is empty, it refills itself. When it is cold, it reheats itself. This means passengers will no longer have to go without a warm drink, he says. It’s the little things that make the train work. The reservation system is similar to that on Intercity Express Trains, in being colour-coded. Each pair of seats has a USB socket and plug socket. There are plenty of tables in each coach, apart from the DT. On RAIL’s trip the air-conditioning is noticeably ‘enthusiastic’, although Nutton says that’s because it has yet to be tested. TPE Head of New Trains Robin Davis explains to RAIL that the trains are fitted with Automatic Selective Door Opening, due to the nature of some of the stations they will serve (such as Thirsk, Seamer and Yarm). He says diesel multiple units were precluded from any bids because at the time of the bid it was deemed that electrification would take place across the Pennines, although this is now no longer certain. “With these trains you can also expand,” adds Davis. He explains that they can be extended up to eight carriages, but after that some of the routes they serve will be at their limit. Why is this the case? Could shunts not take place to ensure the train can still run? He says the trains are about capacity, and that LHCS will offer that. The fixed formation will drive the teams to achieve better results, he believes. For instance, TPE currently serves Manchester Airport with pairs of four-car Class 350/4s. These will be replaced by five-car Class 397s that will occasionally operate in pairs. When they do, they will need to split at Manchester Piccadilly because the Airport station platforms are too short. Once the trains get to the UK, very little will need doing, says Davis. “Ride quality will need checking, and testing the GSM-R, and then mileage accumulation and fault-free running,” he confirms. This should take around ten days, and deliveries are expected to be about one per week into traffic. One anomaly is the spare DT. It needs to go through its own mileage accumulation, but because it is not fixed to a set that will prove tricky. However, these are minor quibbles in what is a transformational project. TPE has gone back in time with LHCS, but it is still radically different to the days of weary Class 47s arriving with rakes of seven or eight Mk 2s. The North has brand new trains… the future has arrived. To read about the first rake of TPE Mk 5A set being accepted by the operator, read RAIL 877, published on April 24, and available digitally on iPad and Kindle from April 20.